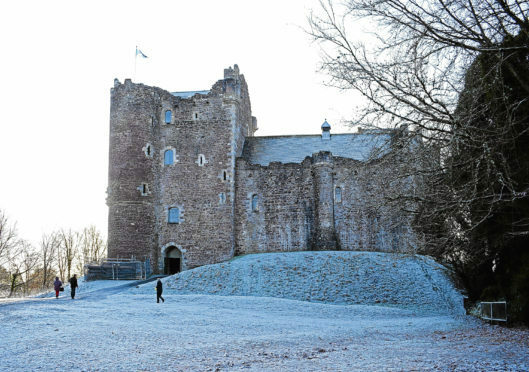 Doune Castle, Perthshire, one of the major locations for the hit TV show, Outlander, has seen a huge increase in visitor numbers. Something about the celebratory smugness that greeted new numbers of visitors and new millions of pounds generated while Edinburgh strangles its own infrastructure, while the human waste piles up along the roadsides of the North Coast 500, while disgorged cruise liners clog the streets of Kirkwall and motorhomes throttle the skinny back roads of Skye, while carefree mobs picnic on the battlefield at Culloden… something about all that made me reach for my bookshelves and sanity. I found it at once because I know where sanity lies in my bookshelves. It lies in a book called A Sand County Almanac. In particular it lies in the foreword which is signed off: “Aldo Leopold, Madison, Wisconsin, 4 March 1948”. There, in 26 words, is the nub of our condition. The bottom line for everything which we pronounce to be a success is whether or not it will be good for the economy. Whether or not it will be good for our land, whether or not it will serve the cause of beauty, whether or not it will enhance our quality of life, and whether or not it will enhance the quality of life and the diversity of those tribes of nature with which we share this land… these are considerations that do not enter into the equation. In innumerable ways, A Sand County Almanac is the best work of nature writing in the language we call English, full of insight and timeless truths. In 70 years, it has never been out of print. Its focus may be the American landscape, but its truths are eternal and its prophecies are global in their reach. Leopold’s brief foreword is divided into three sections. The final one, from which the quote above is taken, begins thus: “We abuse land because we regard it as a commodity belonging to us. When we see land as a community to which we belong, we may begin to use it with love and respect. There is no other way for land to survive the impact of mechanized man, nor for us to reap from it the aesthetic harvest it is capable, under science, of contributing to culture. A small symptom of all that is Doune Castle, halfway between Dunblane and Callander. I have known this place for 40 years, the extraordinary power of the building’s 15th Century architecture, and the quiet beauty of the uncoiling River Teith below its rock plinth. Kingfishers, sandpipers, dippers, grey wagtails, otters and pine martens are among the natives, and the riverside paths have always delighted the native people. Then, in quick session, the castle was claimed by Ivanhoe, Monty Python, Game of Thrones and Outlander, and while VisitScotland clucks and struts its approval, the dignity of the 600-year-old architecture and the unhampered progress of “things natural, wild and free” have been trashed. The place is on every tour operator’s must-see list, and what I think of as tripadvisor syndrome has the place by the throat. The access road is, well, mediaeval, and narrower than some of the hundreds of coaches that creep down it towards a small car park that can’t handle the number of cars that want to use it, far less the campervans and motorhomes. The one-way system of entering and leaving the car park is not negotiable for coaches and motorhomes, but that doesn’t stop them trying. Chaos has become routine. The surroundings of the castle are plagued with loud crowds of dropped-off tour parties, who sit around ignoring the castle and admiring their phones. The wildlife of the river is mostly elsewhere. From Venice to Barcelona to London, those who have to live with the consequences of a berserk tourist industry are fighting back. In Scotland, we need to think twice, and do it now, before we become “so obsessed with our economic health that we lose the capacity to remain healthy”.